A painting by Bettye Reagan, a local artist in Central Florida, inspired by a photograph of Downtown Oviedo, Florida sometime, between 1880 and 1919. 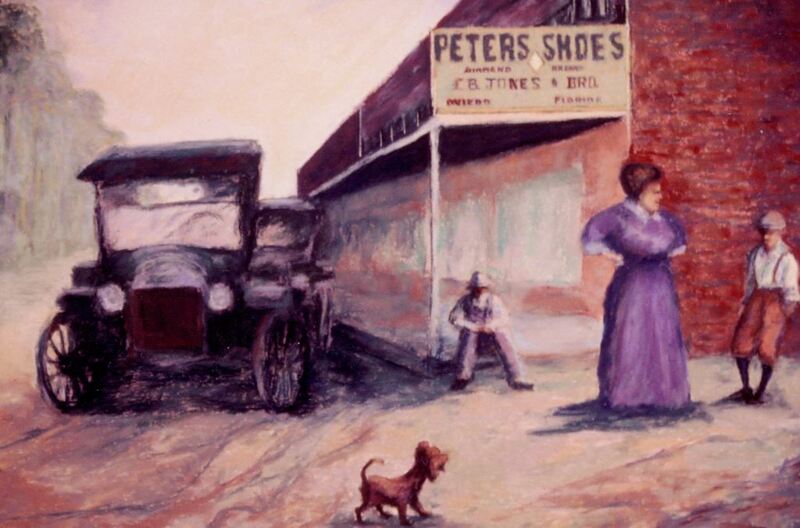 The painting depicts two past businesses located on Broadway: Peters Shoes and J. B. Jones and Brothers. The Timucuan Native Americans originally inhabited the area of present-day Oviedo, although the remains of their settlements have disappeared. Homesteaders arrived along the shores of Lake Jesup in 1865 just after the Civil War ended and began growing celery and citrus. The area was called the Lake Jesup Community until March 13, 1879, when postmaster Andrew Aulin, Sr. (1843-1918), a Swedish immigrant, chose the name Oviedo. Original painting: Reagan, Bettye. Peters Shoes. 2001: Private Collection of Bettye Reagan. Digital reproduction of original painting: Reagan, Bettye. Peters Shoes. 2001. "Old Downtown Oviedo." RICHES of Central Florida. Reagan, Bettye Jean Aulin. 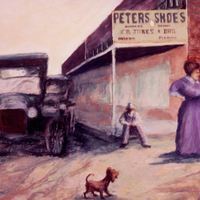 “Peters Shoes by Bettye Reagan, 2001.” RICHES of Central Florida accessed April 20, 2019, https://richesmi.cah.ucf.edu/omeka/items/show/6939.